I remember an old (90's) program, run in DOS, that allowed its user to create posters, invitations, cards, etc. It had mouse support and its own GUI with windows, bars, fields, etc. 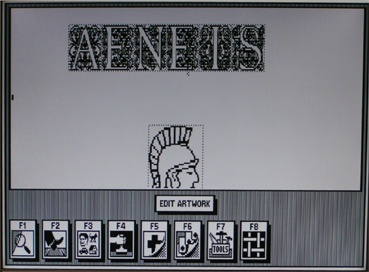 The work started with choosing a template (for example "a poster") and then the user could place graphics and text with the mouse. Each element put in workspace could be edited, moved, deleted, resized. Just like in today's Inkscape or CorelDraw. If you wanted a long banner with a text stretching on 3 A4-pages, you just chose something like "long banner", chose desired size, put text and let the wizard guide you. I remember myself creating cards for my mother and grandmother, banners and posters for school, but I don't remember the program's name. I believe it was something like just plain "Artist", but I'm not sure. I tried to find this app many times -- always failed: "Artist" is too common name, I think so. Does anyone know the application I'm thinking about? I'm pretty sure I had a copy early on for one of my early PC's. Never did find much use for it, but it was available practically everywhere. Could be any of several. PrintMaster fits the bill. I think later versions of PrintShop had mouse support. PFS First Publisher had templates that may have included those style. The program I used the most was called Fontasy but I do not remember any of the features other than it did very nice cards, banners and posters. Not the answer you're looking for? Browse other questions tagged ms-dos graphics or ask your own question. How do I create a boot menu to select between Windows and DOS?